See scan - perfect condition. This is a nice and rare Imperial German bronze medal 1895/96 for the war railroad construction. 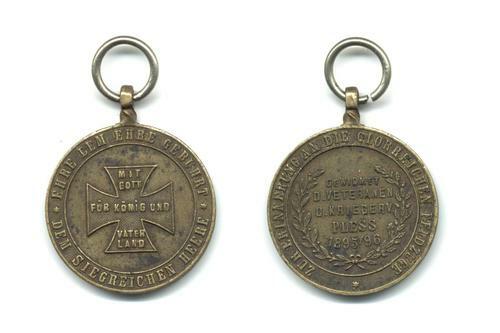 The obverse says EHRE DEM EHRE GEBUHRT / DEM SIEGREICHEN HEERE and the reverse says ZUR ERINNERUNG DIE GLORREICHEN FELDZUGE / GEWIDMET D. VETERANEN D. KRIEGER V. PLESS 1895 / 96. Very nice and rare militaria / military collector item and one of the nice German medals. 1839 Ottoman Turkey Royal Cu medal UNLISTED !